Here are a few pictures from preparing Spaghetti for our January Laguna Mountain Trip. Step by Step instructions follow below. 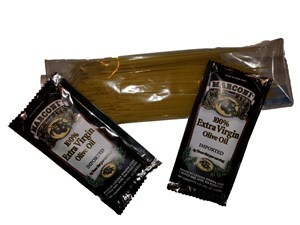 Prep for great trail spaghetti includes either dried tomato or tomato paste. 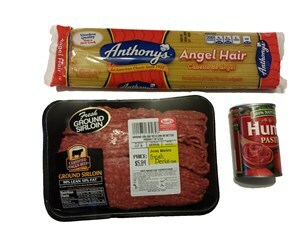 Prep ingredients for GREAT trail spaghetti – hamburger. 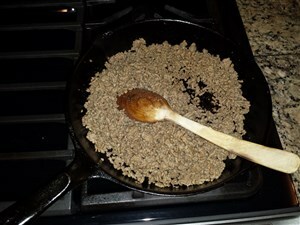 Prep ingredients for GREAT trail spaghetti – hamburger dehydrated after two hours is done. 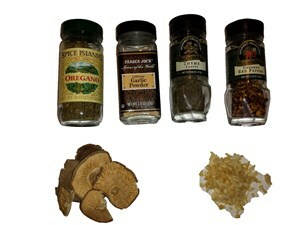 Step by Step Instructions for 2 servings. Backpacking food preparation can be overwhelming. This recipe is a bit complex compared to buying a packaged dehydrated dinner, but worth all the prep time. I ate this dinner four times over 21 days on the John Muir Trail. The big picture: On the trail only cold water is added to start the rehydration and boiling water is used to heat up the sauce and rehydrate the angel hair pasta. 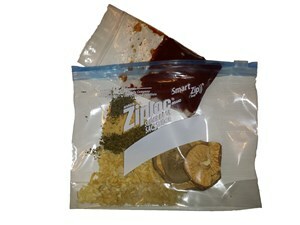 Ziploc A has spices, dried mushrooms and onions, dehydrated hamburger, and olive oil packets. Ziploc AA has tomato paste which is sealed and goes inside of Ziploc A. At lunch, dinner prep starts. Cold water rehydrates Ziploc A while you hike. Preheat oven to 200 deg F. This is a very low temp, this is not a typo. Fully cook hamburger and drain off all fat and juice. Spread hamburger out on a baking sheet. Place baking sheet with hamburger into the 200 deg F oven. Every 20 min, pull the baking sheet out and break up the crumbles. Continue to bake until there is no moisture in what is now beef gravel. Beef gravel can be stored in the freezer for 6 months. Some people say a year. Ziploc A, Create the Sauce. 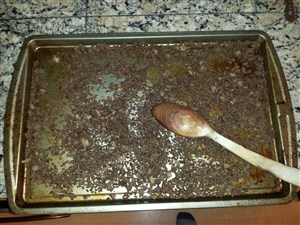 2 TBS dehydrated hamburger, also known as beef gravel. 2 TBS Tomato Paste (OR dried tomato if one wants to order it). 2 portions Angel Hair Pasta – ¼ of a 1 lb bag. One portion is 1/8 of a 1 lb package. This will look like very little food. 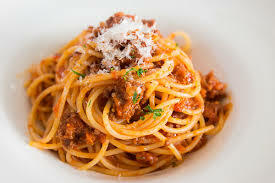 If you are a huge pasta fan, you could double your portion. It will still look small, but keep in mind it expands a LOT. Please note – it is critical that one brings angel hair pasta and not regular Spaghetti. Regular Spaghetti needs to be cooked and a JetBoil cooking system will not work! 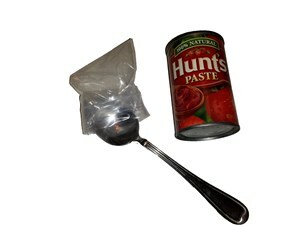 Ziploc A. empty the tomato paste and 1-2 olive oil packets into the Ziploc. Let sit in Ziploc A for 3 to 4 hours and absorb the water. Pour about ¼ of the JetBoil water into the sauce to heat it up. You could wrap a sweatshirt around it to keep it warmer. Leave the remaining water in the jetboil and add the 2 portions of Angel Hair Pasta. Very briefly bring back to a boil and stir. Turn off and cover. Let Angel Hair Pasta stand for 5 to 10 min. With practice, all of the water will be absorbed. Serve one portion of Angel Hair pasta into a bowl and add the sauce on top. One can leave the second serving of pasta in the JetBoil, add sauce on top, and have only 1 JetBoil, 1 bowl and 2 sporks to clean.